Malta is a rocky island where nothing grows. There is no fresh water or soil. One would expect only seafood and it is true that Malta is popular for seafood and meats. And we love to try the local, traditional foods everywhere we go. That can be a little tricky, to say the least. So, it was a treat to find restaurants like Grassy Hopper in Gzira, Malta; Mekren’s Bakery in Nadur, Gozo; Café San Martino in Gozo’s Ċittadella; I Giardini do Babilonia in Sicily and so many more vegetarian and vegan options. Surprising, despite the geography and culture, vegetarian food in Malta is excellent. Malta imports all it’s food from neighbors like Sicily. There were so many vegetarian restaurants that we could only visit a few during our stay. Read 5 days in Malta for our itinerary; Stories of Maltese People and Culture for historical and contemporary Malta; and this article for the foods we loved in Malta and Sicily. Grassy Hopper in Gzira, Malta is an all vegan restaurant in Gzira. It is my favorite kind of restaurant because we can eat anything on the menu, including drinks and desserts! The restaurant has a trendy and casual vibe with an innovative menu. It was full when we arrived but luckily they were able to get us a seating. It seems to be popular with locals and tourists. The group next to us seemed like solo tourists. We overheard them exchanging travel stories from around the world over a group dinner. The decor of live plants and quotes in Grassy Hopper in Gzira is inviting and relaxing. It makes us feel closer to nature and the earth. Yummy and healthy fresh juices in Grassy Hopper in Gzira, Malta. A delicious and huge Cuban burger dish in Grassy Hopper in Gzira, Malta. For lunch, Grassy Hopper has a full menu. For dinner, they pick a cuisine each day and make several items from the theme of the night. They had a Cuban menu on the day we visited. The much anticipated Bucchus restaurant in Mdina, Malta lived up to our expectations. It has the charming decor of a restaurant set in a cave. It does look like a high-end restaurant, set in the medieval times with modern food. It’s very fitting in the Mdina, a medieval fort, and the first capital of Malta. Like us, other diners planned to dress up for the dinner, except they executed on their plan while we skipped the dressing up part and showed up in our day clothes, instead we used the extra time to explore Mdina. I think our confidence made for our lack of formals. Thank goodness for the sign of Bacchus, we could find the tiny lane to turn. The reception area at the Bacchus Restaurant’s entrance. Asparagus rolled in blankets with pea shoots and a delicious sauce in Bacchus Restaurant in Mdina. Celebrating 25 years together in Bacchus Restaurant in Mdina. The little fishing village of Marsaxlokk has a row of waterfront cafès offering drinks, snacks, and meals. They say people come for dishes made with freshly caught fish and other creatures. We got some delicious bruschetta with a vegetable smoothie and a fruit smoothie. Incidentally, they had just started making smoothies that very same day. We also got to meet locals and witness the Santa Maria parade. Across from the famous Mosta dome church of Malta, are a few cafés. After visiting the church we stopped at the Cake Box in Mosta, Malta for coffee and snacks. It has a nice selection of cakes, pastries, coffee, tea and other desserts. It turns out this is a trendy cafe with five locations across Malta. Cake Box is a happening café across from the Mosta dome church in Mosta, Malta. The Cake Box in Mosta, Malta has a modern decor along with the painting of Mosta dome church’s interiors. Our last dinner was at Shiva’s Indian restaurant across from our resort. After the not so good food or service at another Indian place in Malta, we were very hesitant but we didn’t want to drive or walk too far. So somewhat reluctantly, we decided to try Shiva’s. We were in for a treat. The food was good, the decor was good and the server was friendly. The server was a young Indian student, doing a masters degree in international tourism in Poland. She had come to Malta to work for a semester and earn enough to pay her tuition. She had been working as a tour operator in India for 3 years and was promised by a Polish college that she would get a job in the European tourism industry after the degree. The job promise turned out to be a marketing gimmick. She’s left with her own creativity to find a place for herself in the industry. A deliciously creamy eggplant curry in Shiva’s Indian Cuisine in St Julian’s, Malta. A piping hot tadka daal at Shiva’s Indian Cuisine in St Julian’s, Malta. A simple meal with flavorful daal and silky baigan(eggplant) with naan hit the spot. They were just what we needed before packing our bags for the early morning flight to Zurich. Walking on Gozo’s Ċittadella Wall, we realized that we were really hungry. So when we saw Café San Martin in Gozo’s Ċittadella wall, we jumped at the opportunity. A cozy spot for us at the edge of the Gozo Ċittadella Wall, in Café San Martin. We were in luck, Café San Martin makes amazing local Maltese foods, the staff was super friendly and the chef happy to make vegetarian and vegan versions of many dishes. Great food with views all around, from the top of Gozo’s Ċittadella from Café San Martino. Since had lunch in the San Martino cafe, we decided to get an afternoon snack at the local favorite, Mekren’s Bakery in Nadur. We’re so glad we decided to make the drive to Nadur village. The bakery is a real hidden gem. After 100 years in operation, it’s still the same – baking treats with pure and simple goodness. It’s a family business with seven sisters and a brother. Still run by the dedication, hard work, and commitment to traditions. They start baking at 4 am each day, 7 days a week 365 days a year. One of the owner sisters of Mekren’s bakery was in the kitchen in the afternoon. We had some traditional qassatats, muffins, and bread. She started helping her brother run the cafe recently as he became a judge. Ever since she hasn’t left. The Mekren’s Bakery sisters and staff make traditional ftira, qassatats, muffins, bread and more in this same location with the same wood fire over for 100 years. She was super friendly and happy to show us around the kitchen. Mekren’s Bakery in Nadur, Gozo has many traditional ftiras which have been perfected for a hundred years. A vegan pie… too bad we already ate lunch and had dinner plans in Malta or we would have bought it at Mekren’s Bakery in Nadur, Gozo. Mekren’s Bakery in Nadur, Gozo, is so small it doesn’t have a cash counter or shop. The little door opens directly into the kitchen, with the 100-year-old wood fire oven on the left and shelves piled with goodies on the right and the kitchen behind it. Thank goddess for Apple Maps, we made it without a glitch. We left with a couple of muffins – the best muffin we had ever had. They were light, fluffy and flavorful with coconut pieces. We took our muffins from Mekren’s bakery and drove around Nadur in search of a café. We didn’t have to go too far to spot a church, town center, and a café. The tea and coffee were awesome. But the ambiance was totally fun! Here is a short video of the cacophony and the liveliness at the café. Listen to the guys chatting, MTV videos playing a big screen, guys playing cards, kids, dogs, teenagers, youngsters and moms hanging out. Sipping a delicious cup of coffee in a cafe in Nadur village in Gozo, Malta… with coconut muffins from Mekren’s Bakery in Nadur, Gozo. The ferry ride is very short so we didn’t have time to really check it out. But in general, the ferry foods here are pretty lame with packaged pre-made foods like burritos, wraps, sandwiches, chips, drinks etc. Wandering around Taormina, we came across a beautiful garden restaurant that looked just perfect. 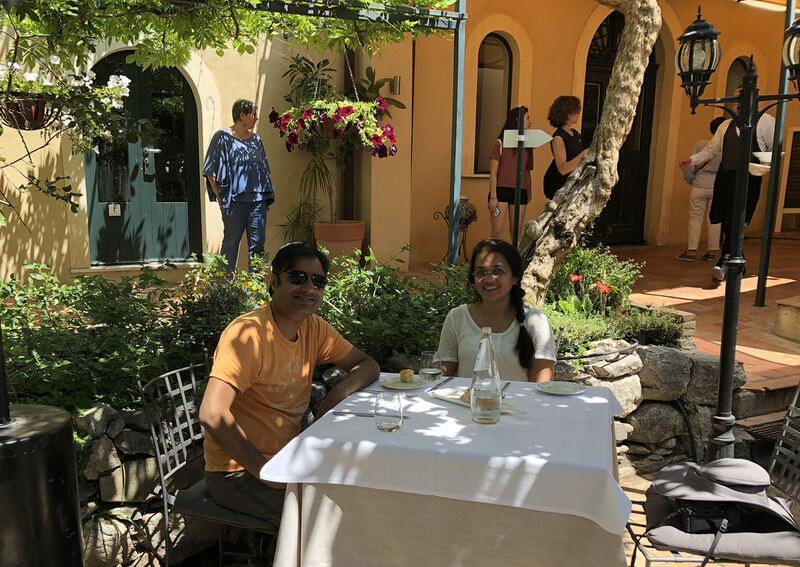 Although our tour guide had made group arrangements with a huge restaurant with a view, Giardini do Babilonia seemed like the perfect Sicilian restaurant. We were so glad we walked in. Built in the 800s as part of the massive garden complex, it was a place for arts and artists to flourish. Today this property is protected as a heritage site. Over the centuries, it has been part of the Roman theater areas, a site for artists and fashion designers. Today it is a restaurant and cultural center for language studies. Giardini do Babilonia in Sicily is a traditional outdoor garden restaurant with meeting rooms along the left covered walkway and casually spread out tables on multiple levels. Sicilian focaccia, white bread, and local nutty Nero flour bread served with a delicious Sicilian olive oil @Giardini do Babilonia in Sicily. Sicily is known for its pasta and vegetables, not pizza. Enough American tourists must be driving this restaurant’s owner crazy, so they have an explicit sigh. While this was a touristy looking place, it did offer a huge variety of local produce to taste and purchase. A variety of olive oils for tasting with bread in Sicily. Sicily wines and limoncello for tasting and buying. Sicily honey, sun-dried tomatoes, capers, olives, and spreads. After a hike on Mount Etna, we stopped at a couple of the rustic restaurants at the parking lot for a coffee and a quick snack. Unlike others, Rifugio Sapienza had multiple vegetarian options, including the local arancini, which is pretty similar to its Venetian counterparts. They were surprisingly quite good on this cold afternoon! Sicilian arancini – rice balls stuffed with spinach or mushrooms. Rifugio Sapienza – a simple cafe in the Mt Etna parking and rest area. The ferry ride between Malta and Sicily is rather long so the cafè gets pretty busy. There are very few vegetarian options and no vegan options except junk food. The few vegetarian options are terrible, so the best option is to bring food to the ferry. The ferry staff is very friendly. They warmed up the dinner we brought from Sicily. This was our first time flying Swiss Air. I had never imagined saying anything good about any airline. But I must say, Swiss Air has the best service and best food of the hundreds of flights we’ve taken. If you can, you must fly Swiss Air. It’s worth it. The menu for the flight was picked from some of the most famous chef’s and restaurants. The lunch was 6-7 delightful courses, even for a vegan. One of the appetizers in the Indian vegetarian menu on Swiss Air. Absolutely amazing crisp and flavorful vegetables… tasted like it was picked the same day. The most delicious and moist vegan cake I’ve tried. I’m glad the flight attendant insisted I try just a bit… they must have known how good it is. The final dessert was an absolutely amazing Swiss mountain milk chocolate. Thankfully we had picked a few at the airport for kids. Maltese Pastizz is a traditional savory pastry filled with peas, ricotta or spinach filling. This is a picture from the Swiss Air lounge at the airport but its served everwhere in Malta. Legligin restaurant can do a tasting menu with Maltese dishes which sounds mouthwatering. We made reservations but had to cancel as we couldn’t predict our time. Nenu, an artisan bakery in Valletta has been around forever. I found Jangal vegan restaurant in St Julian using Culture trip but we couldn’t make it there. If you have any recommendations, please do share them in comments below. 5 days in Malta and overview of our visit to Malta, Sicily, and Gozo. Story at Every Corner Malta Photo Gallery is a collection of our favorite pictures of Malta. Stories of Maltese People and Culture is a collection of conversations with people of Malta.